Slow down your rocket in an upper atmosphere. 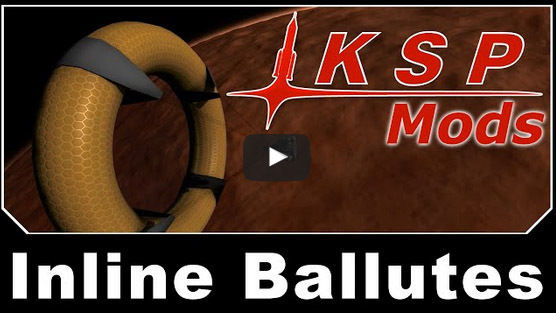 Ballute = parachute + baloon = an alternative to a heatshield. Sample usage: Duna aerocapture and aerobraking, Kerbin reentry for reusable stages etc. RealChute by stupid_chris - especially when with FAR aerodynamics. Config for RealChute is already included in the mod. RealHeat by NathanKell - brings the shock heat in the upper atmosphere to more realistic levels. 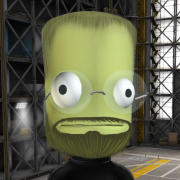 Recommended especially for people that use Kerbol rescale mods (i.e. kscale2 / 64k). Delete previous version of InlineBallutes mod. Unzip KermangeddonIndustries catalog into the KSP folder. Is it even a real technology? Yes, you can read about this technology here [pdf] and here [pdf]. Can I use it instead of a parachute? Rather not. Ballute drag is 4+ times lower than parachute. And then it's much heavier due to used material and shape (Zylon instead of Nylon). However since it's inline version you can use it complementary to parachute. Ballute is also great for semi-powered landing when you just need to use engines just above the surface for the final slowdown. How efficient are ballutes / how heavy rocket can be slowed down efficiently? The higher mass of the rocket the less efficient ballute is (just like a parachute). It is better than a heatshield? Depending on scenario it can be better than a heatshield. Shields usually have small diameter thus requiring ship to be slim and tall. With ballute you slow down in higher atmosphere when there's not much heat, thus you can have more broad vessel design. Also ballute slows you down quite effectively in thin atmosphere (i.e. 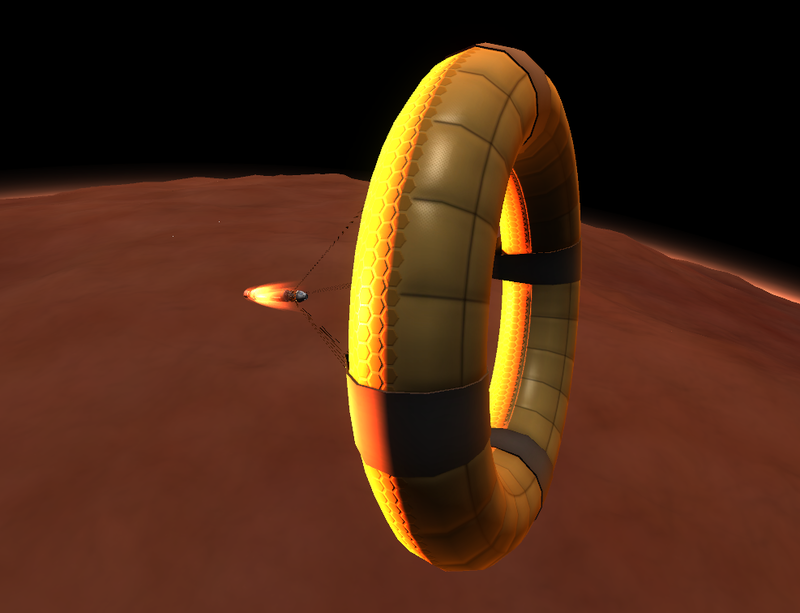 above surface of Duna) whereas a heatshield doesn't have enough area to do this. There might be scenarios when you need both ballute and heatshield for optimal effect decelerating from high interplanetary speed). How it works with stock aero? Can I use it with FAR? Eve - limited deceleration due to thick atmosphere, should work for orbital deceleration, much less for interplanetary speeds(+/-). You can modify sensitivity of parachutes by modifying skinMaxTemp. You can modify drag (deceleration) values by changing deployed area. Tested max deceleration before breaking: about 9g. For FAR aerodynamics you need to install RealChute mod, otherwise FAR is overwritting parachute module with RealChuteLite module which has constant (and very low parachute-like) values. In other word ballutes with FAR won't work without RealChute. Current aerodynamics puts at least 10x more heat in upper atmosphere for ballutes than for parts so I couldn't balance it realistically so I just put unrealistic magic numbers (like 1m K max temperature) so it can behave similarly to stock. Deceleration scenarios: look above, one difference being that ballutes drag under FAR/RealChute is a bit lower than in stock (a little step towards realism;)). Tested max deceleration before breaking: about 4g. What about kscale2 or 64k mods compatibility? You probably want to install both RealChute and RealHeat mods by NathanKell since orbital/interplanetary speeds are much higher in those mods. Downloading! Finally an answer to aerocapturing with DRE installed. Updated the mod with DDS textures, thx Enceos. When you say "2.5m for 30 tons", do you mean that you don't expect that huge ballute to get a heavier ship below escape velocity from interplanetary speed? Also, how do they behave under rails-warp? If I were to make a 2 or 3 pass aerobrake to circularize, would I have problems as I wait to come back in the atmosphere? nice sign, is it somewhere in the texture/normal map? Haven't tested that. It uses same code as stock parachute / RealChuteFAR (depending whether you use FAR or not) so it might be viable. I have a theory that game cuts the chutes when there's no atmosphere. But you can repack them and reuse as many times as you like. nop, just sitting on my desktop. Oh dear I couldn't help but cringe at your avatar. Basically you swap ModuleParachute with RealChuteModule and then add material to RealChute/Materials/ParachuteMaterials.cfg. Most of values like maxTemperature, weight, how quickly it's heating etc. is held in the material config. I know I can't be the only one that would like what I'm about to say. Since there are multiple versions that can be installed (stock, Far, Realchute, etc...), why not have those configs packaged in different folders labeled what each one is meant for? That way no one will have an issue installing this mod. It also means that if someone does have a problem, you know that it's not module related or pertaining towards making the mod compatible with their game. Another bonus is that you're also making the mod easier for the user to install, so that will naturally help in getting more people to use it as well. There are all types of people out there... tech savvy, computer illiterate, someone just starting to use mods not knowing what to do, etc. Might as well try to make the installation as smooth as possible. Install for FAR and stock is the same so there's no need for different versions. RealChute version is not ready yet, I'll appreciate feedback on stats before releasing it. For RealChute I guess I'll just take module manager route so if RealChute mod is detected configs will update automatically. So it will be the easiest route for the end user (just one install for everything). All in all I can eventually make different configs (for easy or hard gameplay) but I'll need a (any) feedback on a current form of how those ballutes perform in different scenarios. Interestingly enough, with Deadly Reentry installed ballutes start to overheat above 60km in Kerbin's atmosphere. I couldn't find the source of the issue.